Nostalgia is a funny thing. Games we remember as being ground-breaking and awesome in our youth sometimes don't hold up as well when we're older. This also makes the generations who missed the games the first time they were released wonder what the hell we were thinking claiming those titles were as awesome as we said. 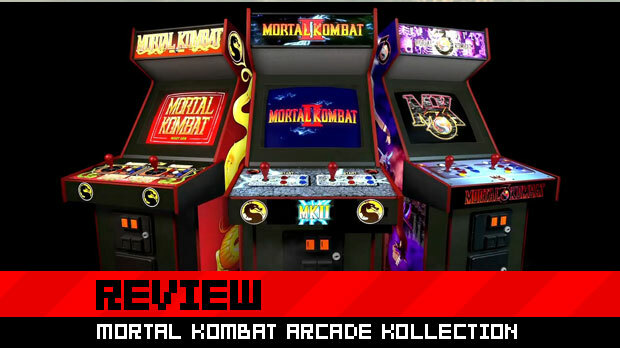 It's this cold dose of reality that the Mortal Kombat Arcade Kollection provides. While part of me fondly remembers pumping quarters into the cabinet at the pizzeria down the street from my house, the other part of me remembers wanting to tip over that very same machine in anger at the cheapness of it all. Join me on a trip down memory lane, won't you? 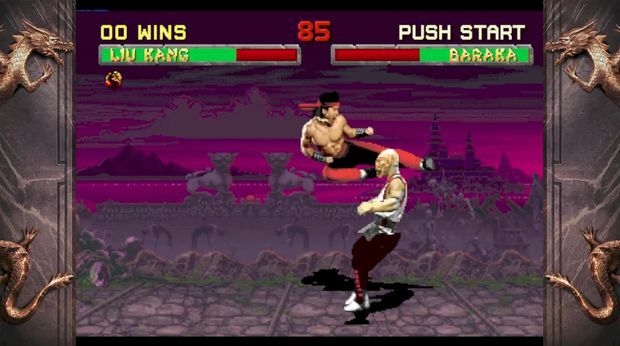 In 1993, the idea of having actors digitized into a fighting game wasn't new. Midway did it just a year before with the lackluster Pitfighter, but there was something about its next attempt, Mortal Kombat. The "animation" was smoother, there was a wider variety of characters (despite there only being seven... and two of which were palette swaps), and the whole thing just seemed more... mature. That and it was, at the time, the goriest thing we'd ever played. Obviously, it was a simpler time. 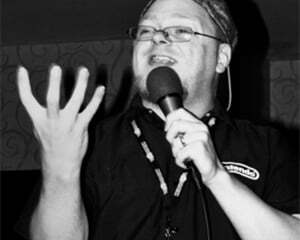 There was no ESRB, no ratings for games, but MK changed all that. Looking at it now, I actually don't know if the original game would even warrant a "T" rating. It's just so comical, so cartoonish in its "violence." And that's where one of the problems lie with this collection. The first MK, which nostalgic, doesn't hold up well. Not only as far as the original controversial gore, but as a fighter as a whole. 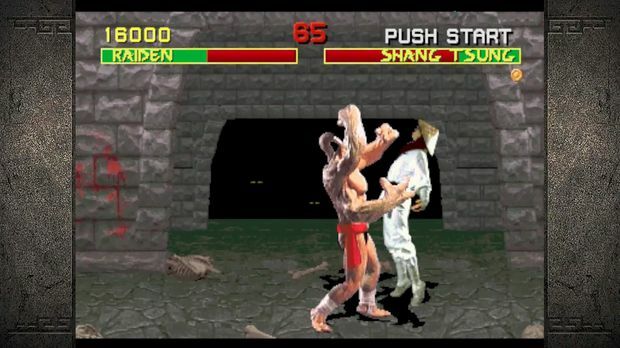 The fight mechanics are just plain bad in the original MK. 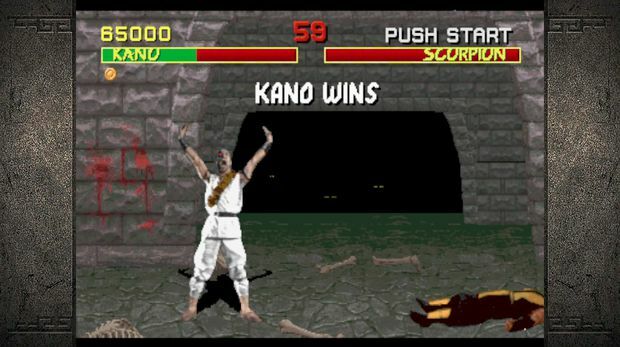 While Street Fighter II was tearing up the arcades with speed and intensity, Mortal Kombat beat you down at a slow, plodding pace. There were no "combos" to speak of, each character only had two or three special moves, and the visuals just didn't look as flashy as the animated sprites of its competition. But man, did it have blood. Playing this game with a regular controller might actually be a hassle, however. This game was built for the arcade sticks, and as such, is best with one. Using my Xbox 360 analog stick is all well and fine, but pulling off the specific directions for a Fatality requires a d-pad that doesn't make me want to stab myself in the face with a chainsaw (and sadly I haven't upgraded to the newer d-pad controller). All that aside, however, this is one of the best translations of the original arcade experience ever offered for this title. Everything looks, feels and plays just like you remember; for better or worse. 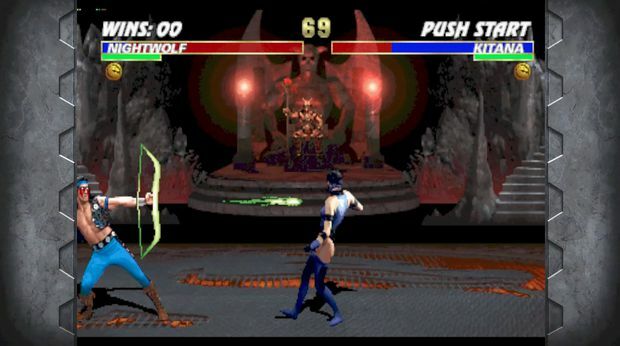 While the original MK doesn't hold up as well, Mortal Kombat II and Ultimate Mortal Kombat 3 fare much better. The pacing was improved, making the sequels move far faster and the "kombat" flow much easier, improving with each iteration. MKII also added a larger roster of characters, more moves per character, and more stages holding secret ways to off your opponent. This of course meant more moves to remember (including more Fatality maneuvers, as well as the goofy "Babalities" and "Friendships"). Luckily, the pause menu in each title (accessed by hitting the select or back button... odd) gives a list of all the moves for your selected character, but only when actually in kombat; you can't check your moves between rounds, even. Again the translation is arcade accurate, but with MKII (and especially UMK3) I'm not sure that's such a good thing. While these are definitely better fighters than the original, they suffer from cheap enemy AI, meant to sap you of all your quarters in the arcade. While the first round will have you easily bowling over your opponent, the following rounds will have you gnashing your teeth in anger as they mop the floor with you. Just as you think you have the upper hand, they somehow pass an attack through your own, or throw you as you're kicking them, causing you to "try it one more time." It was this false sense of "you almost had him" that kept folks dropping allowances into the machines, and it has remained here. What's even more maddening is that this collection offers a selectable difficulty setting. You can't tell it's there, however, as playing on "normal" yields the exact same results as playing on "very easy" or "very hard. Though I do think the higher difficulty just causes more swearing. Ultimate Mortal Kombat 3 is the only game in this collection that has been on XBLA or PSN before, offered a few years ago with a conversion by Digital Eclipse, and taken down once Midway games closed their doors. If you missed it the first time it was available, it's nice to have here in this collection, and it still remains as a good translation of the arcade game. Again, this is both a good and bad thing, as the title was the best-paced entry of the first three but suffered from a strange combo system. Adding a "run" button, UMK3 had you screaming at your foes, and then rapidly tapping buttons in sequence in order to score multiple hits. Affectionately referred to as "dial-a-combo," each one gave no room for customization, instead it had to be the specific buttons in the combo, or it just wouldn't work, almost defeating the whole idea of combos in many fighting games. Once again, the rubberband enemy AI is ever present. Now I know it sounds like nothing but negatives for this collection, but that's not the case. Each title is just as we remember them from the arcade, and the graphics were just as crisp as they were back in the day. In fact, there are a few filters to make them look even better (or even worse) depending on your preference (or sense of nostalgia). You can choose from "klassic" which shows them as sharp as possible, two forms of "painted" which smooth the textures a bit but give it a more "drawn" look, and even "arcade," which includes the scan lines from the original cabinet monitors. For an even more old school style, selecting the display from "standard" to "cabinet" gives the screen a curved look, emulating the tube televisions the machines used to have, for that 'full arcade" experience. Of course, it wouldn't be a modern release of a classic series if it didn't add online capabilities, though calling this "capable" is a bit of a stretch. Each title is plagued by tremendous lag, and the matchmaking is minimalist at best. It's worth a look once, just to see how slow things move (which, if you're playing the original MK online, is very, very slow indeed), but not worth your time after that. If you're nostalgic for the games that used to gobble your lunch money the way that I was, it may be worth the $10 for you to download this collection. However, this won't win over any new fighting game fans. The games really just have not aged well at all, and the terrible up-and-down of the matches to get you to pump tokens into the game still remain, making it an incredibly frustrating fight. If you were playing these in the arcades, you may have stopped well before passing the $10 mark.